PaddleBR was originally created in 2011 by a grassroots group of paddlers who simply figured it was time *someone* started doing *something* to improve paddling in Baton Rouge and the surrounding areas. After making significant progress and creating the first signed paddle trail in the area, PaddleBR was incorporated in 2015 as a Louisiana non-profit. Our dedicated members are always looking for ways to get more people out on the waterways. Come join us for a fun paddle — our night paddling excursions are *especially* enjoyable (but the bright, sunny ones are great, too). Drop in and lend a hand (or just enjoy the water) on one of our work days or cleanups. We even have plenty of extra canoes and kayaks if you want to give paddling a try to see that you love it. For PaddleBR memberships, bumper stickers, window logo stickers, or even custom-made carved cypress signs (like we use on paddle trails), click over to our Support PaddleBR page, and thank you for your support. Terrific Blog!! LIKE it . . a lot! Y’all are awesome! We live on the bayou and have tried to boat back there. It was impossible. This gives us hope! I live on Bayou Fountain and I have now found out that I am not the only person in BR that knows about how amazing it can be! I pestered DPW for months until they finally cleared massive trees blocking the bayou just behind the Archery at South Highland Rd Park. I would like to join the crusade. I would like to contact you, do you have a phone number? While it’s minimal and in poor condition (i.e. I wouldn’t want to try to launch anything with a motor or trailer there, and there’s room for at most a car or two to parallel park), it is a public launch (and currently the only actual public launch on Bayou Fountain as far as I know). We’ve used it as a canoe launch before, and it may have been slightly better than Manchac Park’s steep bank. Haven’t used it again in quite a while, as it’s far downstream of where we usually are. Nathaniel, following up on your recent talk at East Ascension Sportsmen’s League: I would like to discuss a potential project. Please call / email me so I have your contact info. Hey! I’d like to join y’all’s group! How can I go about doing that??? At this point, pretty much it’s a matter of just getting out there and lending a hand with a cleanup or clearing project, just paddling along and saying hello, or coming to one of the very enjoyable moonlight paddle trips (the next one, I’m told, should be the 6th, pending final details). At least one of us is out on the bayou *almost* every weekend (Labor Day Weekend apparently being the second exception this year — there’s offshore kayaking that needs doing). Anyone going,out this Friday, June 12? I’d love to join up with a group. One other canoe might not count as a group, but I’ll be paddling Bayou Fountain tomorrow starting at Highland Road Park at 8am (and then paddling in University Lake in the evening for and before BREC Outdoor Adventure’s Sunset Paddle). I ‘showed up’ with my kayak last Saturday, November 21, fully intending to go out alone, first time ever, down Bayou Fountain. Weather did not look promising, and I had no idea where exactly the launch was at the Highland Road archery park. Suddenly this stranger (Mike Tilley, stranger no more) comes to my truck and invites me along for a maintenance trip with Nathaniel, four miles to Bayou Manchac (no current, one portage around a bridge) and back. I had an excellent experience considering the high water and rain, and learned a lot from two very experienced people (including what gear I need to get for my next trips). I paid for a membership this morning, and look forward to other events. Terrific blog. I live off of Ward’s creek and occasionally kayak the creek. I have a question for your expertise. After the big storms I have a log jam on the creek that passes my property. What is the best way to get this cleared? I am open to ideas. I am an old BR paddler and would love to get out there with y’all. 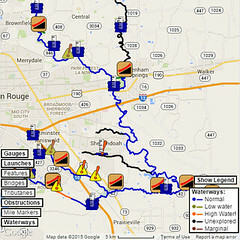 I came upon the PaddleBR blog and am tickled to see folks inclined to do such routes as Bayou Fountain and Ward’s Creek -wet bits I’d thought had seen no paddles but mine. I see reference to a night paddle on 7/23. If I watch the blog will more info show up re. that paddle? I have sent i some Paypal funds for membership and so forth and look forward to getting with you folks on the water hereabout.